A lot is going on when it’s Auto Show week. With the Los Angeles Auto Show in full swing, automakers were looking for ways to involve those who couldn’t visit the land of swimmin’ pools and movie stars. Audi and Infiniti decided to bring their reveal events online to the popular social networking site Facebook. 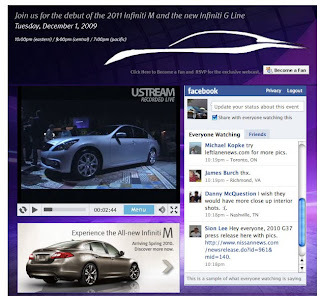 The Infiniti event was an online look into the reveal happening in conjunction with the LA Auto Show. The Audi event was held on the opposite coast in Miami with some additional corporate promotion. Both events used the same template construct with a live video feed and Facebook chat. That statement is representative of how painful it was to watch the Audi A8 reveal on Facebook last Monday evening. Just imagine that language repeated ad nauseam for 30 minutes and you'll understand why the chat participants on Facebook started to get a bit rowdy. The event started nicely enough with TV and film star Lucy Liu welcoming everyone to the event and sharing how Audi is entrenched in design and why they were making the U.S. debut of the new Audi A8 at the Art Basel Miami Beach. A welcoming is nice and expected, but then things got a bit weird. Lucy invited several people up to discuss design and the Miami community’s commitment to art. The discussion went on and on and on like a Sergio Marchionne press event. Chat participants started mocking the Miami community, Lucy Liu, and were getting very frustrated with Audi wasting everyone’s time talking about things they didn’t care about. I was personally waiting for an artistic discussion on chiaroscuro and its meaning in Hieronymus Bosch’s “Garden of Earthly Delight”. Eventually Audi revealed the A8, but it was too much of wait for me personally as I had things to do with my family that evening. My wife’s patience was really being tried and well she wins. I caught the photos of the car on Jalopnik that evening and everything looked pretty good and mostly followed the Sport Back Concept Audi showed last January at the Detroit Auto Show. Last night was the second Facebook vehicle reveal, this time from Infiniti. They showed off some minor changes to the G sedan and were mainly promoting the unveiling of the 2011 Infiniti M.
Maybe Infiniti watched the chat discussion from Audi’s event and decided it was best to keep things on topic. They welcomed everyone sans celebrity, showed off the G sedan, then briefly talked about the key message for the M, and pulled the car cover off the new M. All of this took 16 minutes from start to finish. It was short and sweet. Conversation at the Infiniti event mainly stayed on topic, because it was respectful of people’s time. Most importantly the presentation was all about the cars. Simple. Effective. While companies may want to make their online reveal more of an event by having a celebrity host and tying it in with some philanthropic effort, it is best to keep the event to the reason why people came. Watching something like this on the web is not the same as being trapped in a seat at a Miami auditorium. Internet users can come and go very easily. Plus they didn't get any hors d'uvres or have an incentive to stay for a picture with a Charlie's Angel. Second, you can't just stream video of a whole event like this and expect it to have the same impact online as if you were present. Perhaps a better solution is to offer web viewers (the general public) a condensed version of the event...OR, give internet viewers the choice of sitting through the whole thing or just seeing the unveiling. You just never got the feeling when you were seeing the online promotion ahead of time that you'd have to sit through a bunch of talk about the design community in Miami, you know?